Tougaloo College is launching the “Sesquicentennial Campaign for Scholarships” to raise $10 million over the next two years for deserving students in celebration of its 150th year. “This is our very first fundraising initiative that expressly targets scholarships for students as we more intentionally focus on furthering the transformation of today’s students into tomorrow’s leaders. This campaign is a vital step in positioning the college for continued growth and to ensure its future as a viable, competitive, attractive place for twenty-first century learners,” says President Beverly W. Hogan. Tougaloo College Trustee LeRoy G. Walker, Jr. This is an incredible opportunity to define the Tougaloo College experience for future generations; hence the College is engaging as broad a group of donors and volunteers as possible to support the growth of the scholarship fund. 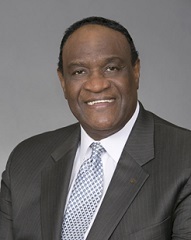 Leading the Campaign Steering Committee is local businessman and Tougaloo College trustee LeRoy G. Walker, Jr. with support from a team of alumni, business and community leaders and friends whose names are iconic in their support of the college’s mission. Although Walker didn’t attend Tougaloo College, he is a product of a Historical Black College and University. As a McDonald’s operator, after moving to Jackson in 1989, he became acquainted with Tougaloo and was later invited to become a member of the Board of Trustees. Shortly thereafter, Walker became chairman of the board where he served for 13 years. Even after his tenure as chairman, he remains on the board because of his commitment to the sustainability of the College, his support of President Hogan’s vision, and the college’s impressive legacy and history. Vice President for Institutional Advancement Dr. Delores Bolden Stamps articulates that it is imperative to show Tougaloo’s students that we support them and we are building a foundation from which to uplift and sustain their education. The formal announcement of this very urgent and important initiative comes at a significant time as the college celebrates its 31st Annual Business Luncheon scheduled for Friday, February 22, 2019 at the Hilton Jackson Hotel. Huntington Ingalls Industries CEO and President Michael Petters will be the keynote speaker. The luncheon brings together more than 300 business and community leaders, policy makers and educators who exchange ideas on economic opportunities and challenges from a state, national and global perspective. in this strategically important campaign. Our time is now. Together, we can transfer this state, region and nation. President Hogan says the legacy of the College is significant and this campaign for scholarships is our opportunity to continue to advance Tougaloo for generations yet to come. She urges alumni and friends to engage with the college to help ensure its posterity and prosperity. As President Hogan opines, the Tougaloo College educational experience is transformational and prepares students to be productive in their time - as difference makers and influencers of change. The 150th anniversary is a way to further amplify the college’s core values of social commitment, equality and academic excellence while reminding the community of the need and responsibility to invest in the future of today’s students by providing them the opportunity to pursue successfully a college education without the overwhelming burden of financial constraints. It is impactful for creating a better world.